How many second sequels can you name that are better than the first? 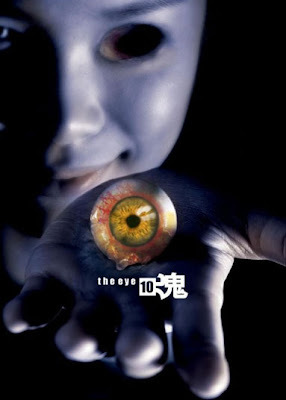 I love The Eye (2002) and was surprised at how good The Eye 2 (2004) was. 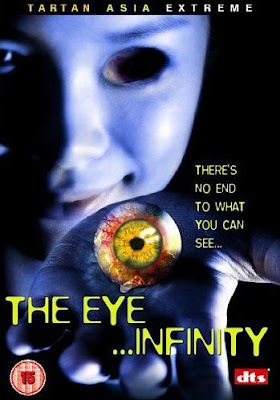 Now I'm surprised at how bad The Eye 3 is - an unfunny comedy-horror from the Pang Brothers (who directed the first two films) is sneaking around under several titles, usually as The Eye 10 and The Eye Infinity, and is finally being released on DVD in the USA, under the more accurate title The Eye 3. So beware – the cover art may look like a horror film, but it’s really trying hard to get laughs, with the directors aiming to spoofing their own films. They only get it half right – some of the scares work, but the humour doesn’t. For instance, the opening scene of a Buddhist exorcism. Inside a circle of monks, a young girl begins to levitate and act like a Linda Blair possessed. Her tongue begins to loll out of her mouth… But they take it a step too far and have the tongue slap the monks around, Three Stooges style! The scene was working fine until the gags crept in. Guess they haven’t seen Repossessed. 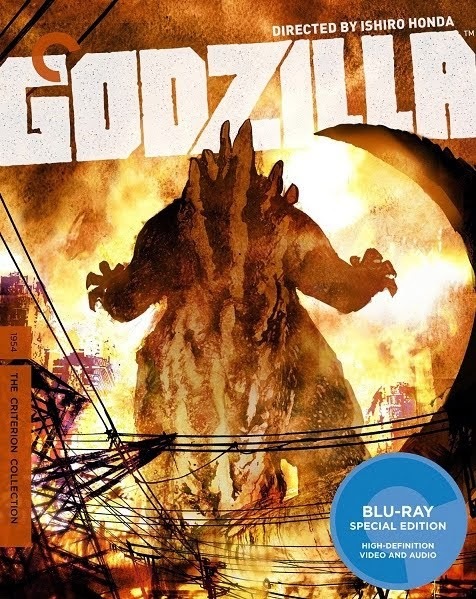 Another problem with the film is its completely disjointed nature, with a far less focussed plot than the first two films. Four friends on holiday in Thailand are telling ghost stories, and their Thai friend convinces them there are actually 10 ways to see real ghosts. The first two ways having been explored in the first two films - “yeah, we heard about them”. As they work their way through the next 8 ways, there’s an uneven cross between Thai horror and broad Chinese comedy. 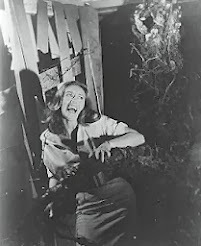 The film works in places, like one scene when they are sitting in a deserted street at night trying to lure ghosts out with food. But rather than a series of spoofs, this looks more like leftover, under-developed ideas. There’s also a constant assumption that seeing ghosts means danger. Surely, the ghosts are around all the time – they are only in trouble if the ghosts have a motive to do the characters harm. By far, the worst scene is when a possessed human gets mistaken for a body-popper by two B-boys, who then try and engage in a challenge dance. No, no, no. The cinematography is colourful, moody and predictably green for ghostly scenes. But unlike The Eye 2 where the editing was calm, the cutting style here is fast and random. 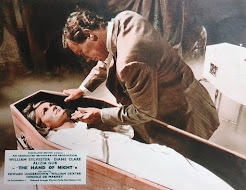 The special effects start off well with some ghastly make-up effects, but then there’s an over-reliance on an easy electronic ripple effect over many of the ghosts – obscuring their features. 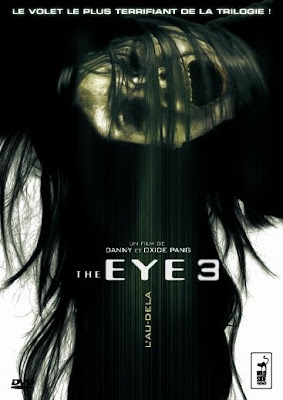 The Eye 3 is getting released in the US at the end of June, with that misleadingly scary cover… It’s already out in the UK and around Europe. Personally I don't find the film that bad. Maybe it's because I am not a film expert like you. I watch this film , just like a typical layman audience. Being a Chinese, I can relate more to the ways of seeing a ghost as described in the movie, since I have heard of them when I was a kid. Hence I actually find the film quite scary. You're not the only one who liked it, NoEye, they're making another sequel. I woudn't say that I'm a film expert though, more of a fussy viewer!